Solid waste reduction, hopefully leading to nearly zero waste going to sanitary landfills, is a key sustainability strategy. After all, what's sustainable about using significant amounts of land to hold waste products? Using large amounts of energy to incinerate solid waste isn't so practical or environmentally sound either. If you can imagine trying to find a place that will accept a landfill in its midst, you understand too that there are very real social costs associated with landfills. But as we'll explain, the benefits go beyond simply resolving the problem of landfill space. Source reduction (some call it pre-cycling) and recycling are the first steps toward closed-loop cities where all waste products become a new input into something else. We actually think technology advances will help us resolve part of our solid waste problem, but on this website, we should be talking about what individuals and neighborhoods can do. 1. Be careful not to use more paper than necessary at meetings and events. Distribute as many documents as possible beforehand by e-mail, or just make them available online for anyone interested. Some neighborhood meetings we have attended have handed out so many paper reports that picking up the leftover handouts took several minutes. When people are not reading reports or leaving them behind in the meeting room, that's a signal that you are giving out more than you need to. An alternative is to ask anyone who wants a copy of the treasurer's report to raise a hand to request it. Give a verbal report of the highlights for the sake of transparency, but maybe not everyone needs the paper copy. 2. Provide recycling at all neighborhood functions. In addition to the benefits of allowing society to reuse materials, recycling often calls to mind how much we consume. We know it's a little extra trouble to provide a recycling container, but after a few meetings, it will become routine. 3. Re-use and re-purpose materials wherever possible. We mean everything from re-using the holiday decorations from year to year, to thinking creatively about how waste from new construction or housing rehabilitation projects can be re-purposed into something benefiting the neighborhood. Most neighborhood associations are quite frugal and therefore inclined to re-use things, but when we have seen needless disposal of items, it's usually been because no one thought in advance about what to do with all those foil garlands and where they could be stored. Similarly, we saw framing lumber from a neighborhood housing corporation go into the dumpster because no one had planned how it might be used in renovating the playground in the spring. 4. Deliberately select compostable products for any paper plates, cups, or plastic cutlery that your neighborhood uses in its gathering. Similarly, make sure food waste gets composted or that your leftovers are sent immediately to an organization that can use them. 5. Promote your neighborhood, and its business district if you have one, on a great-looking reusable shopping bag. The idea of zero waste has become trendy now, but first, your neighborhood and community may want to try simply to generate less waste by a somewhat realistic percentage. Finding new uses for items formerly disposed of is a new source of revenue for businesses. Reduction in waste disposal costs usually accompanies the reuse or recycling of materials. New items made through recycling and re-use usually require less energy use than making the same item from new materials. These savings typically are major, when extraction and transportation costs for new materials are fully considered. The waste to energy strategies that are effective in some situations can result in savings of fossil fuels often used to generate energy otherwise. Becoming innovative about a zero waste goal leads to business and personal creativity, as new uses are found for what was formerly considered useless. Great new looks in furniture, countertops, carpeting, and landscaping products have been discovered as people and firms innovate in waste reduction and reuse. Food manufacturers will find some great new tastes as they look for ways to sell their not-quite-full bottles or excess production to other food manufacturers. Awareness about waste products can be of obvious benefit to birds and wildlife. Keeping plastic bags out of our streams is essential if we are to keep oceans healthy. Even if inventors can figure out how to clean up the plastic in our oceans that is destroying sea life every day, we still must cultivate new habits to keep them clean. So in sum, a waste reduction, separation of waste, or zero waste strategy provides obvious environmental benefits, conserves energy, prevents fossil fuel use and the attendant problems of climate change and geopolitical entanglements, and nudges us to create new interesting products. What a great pro-business and pro-environment strategy! Waste Reduction, Re-Use, Recycling, What's the Difference? We've come to the idea that there are significant overlaps among the commonly cited 3R's, reduce, re-use, recycle, and a fourth that people are now discussing, recovery. In theory, it's a progression, where best is to not generate waste in the first place (waste reduction). Examples of waste reduction are less packaging and never buying bottled water in the first place. Then next best is to re-use something in exactly its current form. We all re-use if we take the computer's packing box, give Mom her Mother's Day present in it, and then she throws a pretty scarf over it and uses it as a table in the rec room. We recycle when we put our aluminum can in the recycle container and the next thing you know, the beverage packing company has purchased that recycled aluminum. But not without considerable transportation and energy costs. You might be unfamiliar with the recovery idea, but examples are experiments in tapping into methane gas in landfills for use as energy, or otherwise unearthing a known waste product to put it into productive use again. So it makes every kind of sense for industries, businesses, and residents in close geographic proximity to each other to figure out how best to reduce their own waste disposal by selling or giving away what is waste to them, but treasure to someone else. Only by blurring the lines among the three categories, concentrating on our local economies, and thinking smart about all the environmental and social costs of each of the 4R's in a real world situation will we recognize maximum economic, environmental, energy conservation, and social gains. Is Waste Reduction or Even Zero Waste Practical? About now, some of you are saying that's really nice, but it can't be done. Well, it can be done, as Denmark shows. It's been reported that Denmark now recycles, reuses, or converts to energy 90% of its solid waste. Determined recycling is a large component, and incineration for energy also helps them increase that percentage. Here's a user-friendly description of the Danish model of waste reduction. A few of you are still skeptical. You discount this experience by saying, "Well, Denmark is a tiny country; they can get around on bicycles there. They've been taxing solid waste since 1987. They're kind of socialistic compared to the U.S., and we really don't want to go to that level of government mandate." So for you, check into how Cleveland area industries and cultural institutions are benefiting from Cleveland zero waste strategies. Even a microbrewery there engages in a number of waste reduction techniques. That's why it seems to make sense to talk about closed-loop cities. In a closed loop, everything is used, re-used, or converted. Yes, composting and conversion of trash to energy are part of that equation, so not everything is recognizable on the other end. We aren't necessarily talking about simply making beer cans into more beer cans, pouring all the latex paint scraps together and mixing judiciously to make a new product, selling your scrap plastic to your industrial neighbor, or sending the excess ketchup production to the homeless shelter. A few items have to change form dramatically. But the more we can make our local economies and our local cities self-sufficient if need be, the better our protection against various economic, environmental, climate, and political disasters. To dig into the details of how the business community in particular can make a very significant contribution to both waste reduction and the financial bottom line by intra-business trading and selling, consult the Business and Sustainable Development global guide. So on this website that aims to be extremely practical, except we call it Useful, we have to tell you that zero waste or very significant waste reduction seems more and more feasible the more we research the topic and listen to stories. For zero waste to succeed and produce the real environmental, economic, and social benefits that can occur, the largest barrier seems to us to be ways to understand business and large institutional scales of waste as potential assets, and then methods of communicating the availability of those potential assets to possible users. In other words, we need to create markets. While there are some on-line and off-line attempts to create these markets, much more work could be done in this area. Of course, incorporating all the environmental and social costs of waste disposal into the tax and/or fee structure is a useful incentive to becoming more communicative about what we're throwing away. And some unemployed folks or teams of retirees who now need more income could go into business to help industries, schools, hospitals, universities, and office compounds videotape and then catalogue their actual wastes now being sent to disposal. These businesses could earn some income for their entrepreneurs by matching unneeded outputs with salable inputs for other businesses. The solid waste industry itself must embrace change and go into the business of creating effective markets for waste products and also separating household waste into additional meaningful components. Residents and community organizations also can help bring about waste reduction and even zero waste and closed-loop cities by demanding better information about what's happening to their household waste. They even should question what happens to the items they now hand-carry to a recycling center or have picked up through curbside recycling. Are the recycling processes really energy-efficient, or do they actually cost an unacceptable amount in energy expenditures? Are the little pieces of forgiveness, which are granted for incorrect sorting by individual households and for being able to leave the labels on and the staples in, really cost-effective? 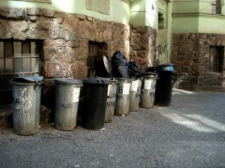 At least in the current mood, where sustainability is so popular that the term has become almost meaningless, residents could be given financial or regulatory incentives to be better partners in the creation of effective markets for second, third, and an infinite number of lives for their waste stream.